In my search for patterns, I’ve been disappointed in the offerings from the major pattern distributors and have begun searching alternative companies for desirable patterns. If I’m disappointed, I’m sure I’m not the only one! I’m a huge fan of independent patterns and I’m always on the search for new ones. I thought that I’d include a working list of pattern designers that I’ve come across for your reference. I’ve tried to stick to designers whose focus is on adult apparel. Some of these brands have numerous patterns while others are smaller outfits with one or two items. I haven’t tried them all but each listing has a pattern that I would like to try. Please be aware that the links below will open in a new window. Colette – There’s little that I could say about Colette that hasn’t already been said – vintage inspired designs with excellent community support. Sewaholic – From Vancouver, Tasia designs for pear shaped women but these classic patterns would look good on many shapes and sizes. Where are our passenger trains? Europe has a wonderful train system for passengers and freight. It was also nearly completely destroyed during World War II. The United States had a fledgling system that was built up until the highways took over in the 1940s, at which point it began declining. Passenger train service for most communities ended sometime before I was born in the early 1960s. I don’t remember seeing livestock transported via train since the mid 1960s. In the 1970s, train tracks were being abandoned and ripped up, leaving vacant corridors through farms and towns across the nation. Some of the routes have been taken over by Rails to Trails, providing hiking and biking paths. Many lay overgrown and forgotten, locations remembered only when the blackberries that have swallowed the rail bed are ripe. Today, our sole option for train travel in most areas is Amtrak, and that is IF service exists. You can’t always get from here to there via train, and it certainly won’t be easy or convenient to get there. Here in Mississippi, our major cities are Gulfport-Biloxi, Greater Pascagoula, Hattiesburg, Jackson and the Northwestern corner as a portion of the Greater Memphis area. Most residents would also add Meridian, Columbus, and Tupelo to those “metropolitan” areas, as they are the largest cities in their regions. That makes a short list of just eight areas in the state that are anything resembling “urban”. Using Mississippi as an example, just try to get from one city to another via a train. Most don’t have passenger service at all, including the Gulf Coast, which is also the big tourist destination of the state. You can get to Jackson from Meridian or Hattiesburg…if you don’t mind a multiple day trip with a layover in New Orleans. There are two trains in Mississippi, both of which are either departing New Orleans or terminating there. One is the Crescent, which runs from New Orleans to New York. It makes multiple stops in Mississippi: Picayune, Hattiesburg, Laurel, and Meridian. 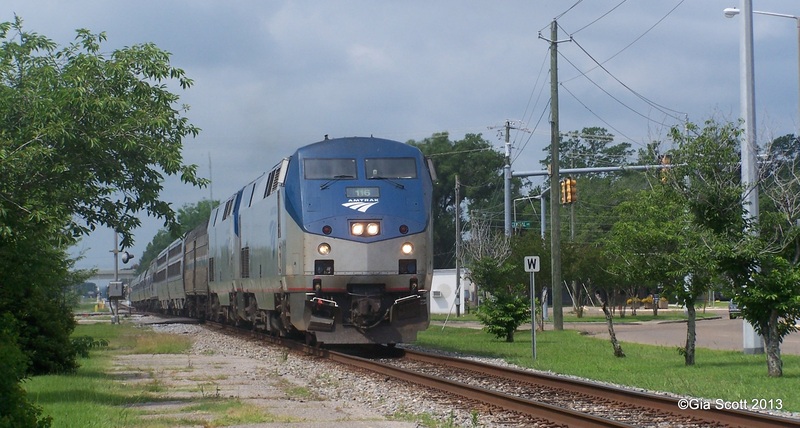 The other one is the City of New Orleans, which runs from New Orleans to Chicago, stopping in McComb, Brookhaven, Hazlehurst, Jackson, Yazoo City, Greenwood and Memphis, TN. That’s eleven stops, and includes four areas that we’ve identified as “urban”. Compare that to England, with 11 terminal stops. I couldn’t count all of the stops or trains on the map. It was a lot more than just 6 trains that passed by a station once a day, going one direction or the other. The USA hasn’t had such poor train service since the days of the Wild West. Okay, I’ll admit that Mississippi isn’t exactly a prosperous state. We don’t have a lot of industry or tourism going on here, and most people can’t afford to travel much even if there was a good service to get somewhere they wanted to go. So, we’ll turn to our southern neighbor, Mexico. Mexico has roughly 738,000 square miles of territory. It includes deserts, mountains, and rain forests as well as farms and ranches and urban areas. They have three tourist trains and one commuter train for their passenger service. Wow, we have train service better than Mexico? I’m not sure we should get excited. We also don’t need soldiers armed with machine guns on our trains in the USA to prevent robbing by bandits. In fact, train robberies are not something that has occurred in recent history in the USA, and if it did occur, there would be ample press coverage of the event. Americans don’t like seeing soldiers armed with machine guns in tourist areas. It just makes us nervous. We’re funny that way, considering our attachment to the right to own a gun. We talk a lot about mass transit, about reducing our carbon footprint, and about energy efficiency. We talk about reducing our dependency on oil. I’m all for it. But we need safe, efficient, economical, accessible alternatives. Our country is vast, the distances often are equally long. We have a stagnating economy and shrinking industrial and manufacturing base too. But our government is not addressing these transportation issues. Think about it. We need jobs, not more welfare lines. Mississippi may be the poorest state in the union, but all states are having trouble with their economy. Imagine the jobs that would be created when rail lines are repaired and upgraded, when train stations are put in place, when cheap and efficient transportation is readily available for cargo and commuters alike, whether within the same state or to a distant port. Imagine the gates being opened, allowing travelers to experience more of America, to visit the towns where their grandparents or great grandparents lived. Imagine businessmen and women having the ability to easily visit small manufacturing facilities in rural communities without chartered planes or hours of driving. And it’s not going to put trucking companies out of business either. There will still be the same need for trucks as ever, especially since the bulk of their business is bulk customers, not the small company that needs to ship out one or two pallets of goods to each coast each week. It’s not going to end the days of the road trip either–there are times and places where roads and cars are essential transportation. It is going to create jobs of feeding workers and travelers near rail stations. It’s going to create a need for taxis and buses to get them from the train to their destination. It’s going to create a need for small trucks and couriers to transport goods to and from the rail station. Manufacturing will have an increased need to supply parts and supplies for trains and rails, stations and offices, ticket sales and on-board meals too. Mom and Pop businesses, whether selling local memorabilia or fast food from a cart will explode near the stations, further enriching local economies. Accommodations, from cheap motels to fancy restaurants, will also have a central place to attract customers from. Don’t think that corporations won’t look at the possibilities too, but in rural areas with a few trains a day, it will be the Mom & Pop businesses that can fill a niche and pay taxes. Oh, and you too. You’ll be able to get to Jackson for that special event or doctor’s appointment without having to drive your car. If we’re smart about it and push for it, we’ll even have all passenger trains allowing passengers to board their bicycles too, further reducing carbon footprints for those avid cyclists who also spend money on everything from more bicycle stuff to cold drinks on a hot day. European travelers, accustomed to train travel, will find that spending their Euros in America to be even more attractive, as they enjoy a familiar mode of travel, renting their bicycles at the train station for their jaunts around small towns and cities, through the countryside or to a special attraction. We can do it. We should know how–we spent a great deal on repairing the European train system after World War II. We can draw on European and Japanese expertise as we devise an All-American solution that is better, faster, cheaper, and greener than anything ever conceived before. If we can be the first to the moon, surely we can manage to make a train trip simple and cheap on the USA. Sometimes, it seemed it ranked as “crazy busy.” I had a lot going on, then because neither one knew of issues in my life, my daughter and mother decided to surprise me one Monday morning out of the blue. It was pretty simple, my daughter asked me to meet her at Sam’s Club (about 40 miles away from where we currently live) so that she could do some shopping there, as she didn’t have a card at that time. I agreed, and on the designated morning, Greg & I made our way down I-10 to meet her. We’d already wreaked havoc on her plans–she wanted to do lunch and THEN go shopping, but because of her ability to marathon shop after eating…I wanted it in the reverse. I’ve seen her linger in far smaller stores for as long as four hours! So, much to my chagrin that morning, it wasn’t a good morning for me, and I was barely able to walk due to a back problem that had flared up. The only solution was one of the electric cart things, and while I’m perfectly aware that these are provided to aid people such as me with mobility issues, it’s also a matter of pride. I really hate not walking on my own two feet, but it was just not possible to do that day. I knew I had a very finite amount of walking before I was going to be in excruciating pain, and the cart was the only way I’d survive. I have new glasses, which aren’t really seeming to improve my vision, but even with that issue, the woman looked decidedly familiar. She should have been too. We also had events planned with Get Ready Go, our Meetup group for camping, outdoor activities, and emergency preparedness. I did cancel one due to weather, but we were already in the area of the event, it was an hour until the event, and it was pouring rain with no sign of potentially clearing up at that point. Two people DID show up, but they already knew I wasn’t going to be there. In the midst of all of this, a coveted job interview for Greg from a job application that had been nearly forgotten about (it was submitted ages ago!) was scheduled, in a different part of the state entirely from where we had been doing our initial house search. That meant switching a lot of gears to head that direction in terms of house hunting. So, on Thursday afternoon, we’ll be in Vicksburg, Mississippi to sign paperwork and make our official offer on a house that we really don’t care that much for, in hopes that we can make it into a home we enjoy. Our first visit ever was just last week to the town, and the historical buildings, hills, and river all make it an appealing location. I don’t know for sure that we’ll end up buying the house–it’s often a long journey from making an offer to actually closing–we’ve done that process twice so far this year, and still don’t own a house! I do have one thing to say about house hunting and real estate agents. House hunting is stressful, you are often stuck with a house for a lifetime, even if you don’t intend it to be that way. For that reason, it’s a huge decision to make, and lots of considerations have to be made. Mistakes can be immensely expensive too, which just adds to the worry. The house we decided to offer on has few of our “wants”–the yard is tiny, there is no garage, there is just a narrow grassy strip for a “driveway”, there is no fence, and the house has all of the exterior charm of a saltine cracker box. We decided that since it had the two “must haves” of internet access (DSL via AT&T) and price, we could change the interior to reflect our lifestyle better (goodbye scarlet carpeting and 1970’s formica counter top!) update with some paint, new tile floors, and we’d have a much more agreeable home for a 3 dog family. The garage can’t be added–the lot is too small, but we may be able to get a permit to add a small workshop & shed in the back yard, eliminating the need to store tools and equipment inside. (Okay, I will confess, not even my desire to protect a lawnmower from the elements is going to allow that indoors…) We may be able to put in a patio & barbecue area for outdoor meals, but all of that lies in the future. Right now, it’s just an offer. For most people, the word conjures up images of happy occasions, like weddings. Its a milestone each year where they measure their success at their endeavor. That’s not true for all of us all of the time though. Some anniversaries mark the date we lost someone, someone important and loved and a huge part of our lives. On those days, for me at least, it’s as though the wound left behind is ripped wide open once again, and all of the agony and pain is right there as I have my annual confrontation with grief. Strong women don’t cry, right? Then again, I never started out on this life trying to become a strong woman. I wanted to be contented and wise. but were they really wasted when I became “Kung Fu Mama” and we played our silly game? The first time in my life that I cried in public was when he died. It was as though someone had blown a hole in my chest the size of Texas, which is about as big as I can actually visualize anything. I was empty. I hurt, I was angry, it wasn’t fair, he was such a wonderful boy, how could this happen? Why me? Why him? What had I done wrong? I had tried to be a good mother, and I had failed, he had died, and I didn’t know why. Outside, the sun was shining and the birds were singing, and that seemed wrong too. It should have been dark, my boy was dead. The world had just come to an end. I had no energy to help his sister, who grieved as much as I was for the little brother she had just lost. I couldn’t see how I was going to live through the day. I worried that he was cold and scared and alone. I was angry because it was so unfair. I could barely look at his friends, and I was angry at their parents. I was jealous. They still had their boys, and I didn’t have mine. His favorite song the weeks before he died was “The World is Not Enough” from the James Bond movie we’d just gotten for him, as he was a James Bond fan, as well as a massive Star Wars fan. We couldn’t play it at the funeral though because the pastor said it was “secular” music and not allowed. His toys and clothes were packed up and stored, sort of like my grief. His clothes were eventually given away. This past spring, we discovered that someone had stolen his toys and other treasures. I hope they bring them pleasure. Those dark days are only re-visited annually, but the pain and sense of loss is always there, like a familiar pothole in my inner being. I can remember when I grasped that dark sorrow for its cold comfort, afraid that if I let it go, I’d forget all the things that were silly and important, like the way his hair smelled when he’d been out playing in the sun, or the way he would wrap his arms around me in an impromptu hug, nearly throwing me to the floor. Then, one night, I had this particularly vivid dream. In this dream, I was at a big family picnic, the kind where everyone from the entire extended family is there, even cousins that you’d never seen before. The kids were all playing, we could hear the innocent joy in their voices as they laughed and called out to each other. My grandmother was there too, but not as she looked in her later years, but as she had when I had been a teenager. She watched me fix him a plate of food, call him to me, and then hand it to him. As I looked at him, I could see that he was rotting around the edges, which was pretty gruesome, obviously. I frowned as he ran off with his food, concerned about this appearance of rot. I woke with a start at that point, feeling sweaty and clammy. It wasn’t easy to go back to sleep either. Was it a vision or a message from my grandmother about my grief? A message from my own subconscious pointing out the futility of my grief and how I was managing it? Did it even matter? The message was heard. It was time to start letting go. The darkest of days, I didn’t feel like I could do it, there was no way I could keep on living. On those days, the thought of meeting him in the afterlife, and having to admit to him that I wasn’t the woman he thought I was provided the inspiration to keep on keeping on. He thought I was the toughest and coolest and smartest mom on earth, how dare I even THINK about giving up? Eleven years. He’s been gone longer than I got to have him, and both his birth and his death seem like yesterday. He’d be thrilled with his little niece. He would find my life amusing and a grand adventure too. He loved camping and hiking and eating…probably eating most of all. I can remember his eulogy, delivered by the sensei from his dojo, a family friend and his best friend’s step father as well. He recalled something my son had told him about how he wanted to be a sumo wrestler because they could eat everything they wanted to. I laughed, it was so very much the way he thought sometimes, and I missed his silly remarks so much already then. I guess I miss them just as much now. He was my fishing and gardening buddy too. Once, we built a “Hand of Thyme” in the yard. It was a giant handprint shaped herb bed, filled with herbs and flowers, of course it had to feature a lot of different kinds of thyme too. It was silly, frivolous and an awful lot of fun too. It’s also a great memory of time spent together. So, tomorrow, if the weather cooperates, I will go fishing with Greg, and we’ll have an invisible boy riding in the boat with us, sharing a favorite activity, even if its only in the memories of my mind. He always hated it if I cried, and fishing is something he loved doing with me. I guess I better pack a picnic too–he used to give me very disappointed looks about fishing trips that didn’t include anything to snack on or a lunch. Sometimes, for those of us who are left behind by the ones we love, life is about figuring out how to keep going, and carrying their memory along with us without turning it into a shrine. So, I baked a cake on his birthday, though I can’t say it was really a celebration. I’ll go fishing on the anniversary of his death, and while it’s far from a celebration, it’s a great coping mechanism and a way to remember the good times without nursing that grief that can so easily turn into a cancerous monster eating away at the joy and passion we should be greeting life with. That’s the key. Keep greeting life with joy and passion, as though you’ve never lost a soul, yet never forgetting that tomorrow just might be too late to tell someone how much you love them, how much you care. Don’t waste your time here, you never know how long any of us has to spend here. We’ve all got an awful lot to do while we’re here, even when it is just for a short time. If we leave this world a tiny bit better somehow than it was when we arrived, we’ve done something noteworthy. What are you doing? How are you spending today? I will confess, I’m reduced to begging. I’m not very good at it, I’d usually rather do it myself than ask anyone to help. Unfortunately, I’m apparently in need of a lesson in humility. Exogeny Network, our website & public face for our radio programs and all the other things we do (or try to do) is now facing some financial issues of its own. Greg and I have covered expenses for the entire thing for the past five years, with occasional donations from considerate listeners and even guests. We have appreciated those donations, and used them wisely. Now though, we’re faced with the reality of our need to raise $510 by May 31st to stay afloat and on the air. If we don’t succeed, neither Greg nor I will be on the air after that point until the financial issues are resolved. We aren’t sure when that would be, either. It might be days, weeks, months, or even longer. Now obviously, we’d much rather pay the bills ourselves and not be faced with the whole issue of begging, but it isn’t working that way. We have discussed the financial issues every direction we could, we have addressed every expense cutting method we could. Unless something unexpected happens, and very quickly, there is no way we CAN just do it ourselves. If we matter enough, if we’re doing a good enough job that you want to see us stay on the air, please…consider donating that $5 or $10 to help. More would be greatly appreciated. We promise to continue producing the best radio programs, podcasts, and web content we can. We’ll list our donors unless they ask to be anonymous too. (First initial and last names) If you want us to put your picture up, we’ll do that too. It’s now up to you, our audience. We’ve done what we could with what we’ve had. If its good enough, then we have to believe our audience will care enough to try and help. If it isn’t good enough, well then, we’ll be off the air and it won’t matter anymore, will it?